Magnificent views of open countryside overlooking vineyard and the stunning forest landscape in central Portugal. Fully paved, fenced and very private. Large lounge with gas fire & reading room with log fire. Large garage with additional outside parking for at least 4 or 5 cars. Spacious master bedroom with south facing veranda, walk-in double wardrobe closet and en-suite with bath tub & shower. Under floor central heating & double glazing throughout. Emergency Lighting & fully wired with data cabling throughout. 3 X Large 3.4m wide patio doors facing south with electrically operated sun shutters. Veranda lounge served by an outdoor BBQ area with wood fired oven incorporated in the garden. 8×4 m swimming pool, set in a large sun bathing terrace. Spacious utility room, borehole, well and irrigation system. This Luxurious Villa been built for the current owners with bespoke features using latest technologies and high standards of finishing. In this sale the owners include a large plot of land surrounding the property which prevents future construction overlooking the plot where the Villa is constructed. 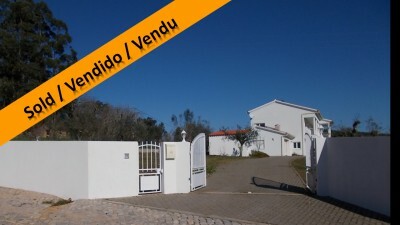 The building finished in 2011 is a very spacious 3 bedroom detached house with a swimming pool, situated near the town of Cabacos in central Portugal. The house, which is set over two floors, has stunning views of surrounding countryside. It is in a quiet, rural position yet close to all amenities. It is connected to mains water and electricity, has under floor gas central heating and is fully double glazed. There are remote controlled gates at the entrance of the property which open onto a large paved area, providing access to the garage, outdoor parking and outdoor veranda lounge and BBQ entertainment area. At the front of the villa, there are 2 large glass doors each side of the main entrance door which open into to the beautiful spacious kitchen/diner and on the other side to the large lounge, these features together with the outdoor lounge and BBQ area with garden provide a modern spacious lay-out suitable for large family entertainment. Through the main entrance door there’s a beautiful staircase leading to the upstairs bedrooms, under the staircase there’s storage area and behind there’s a spacious shower room. Behind the fully fitted & tiled kitchen/diner there’s a large utility room which connects to the garage, also from the kitchen/diner there’s a cosy & comfortable reading room which has a log burning fire place. The entire flooring is under heated and laid with large stylish tiles. The master bedroom has access to a large veranda with stunning views facing south, a walk-in closet with two sets of 3 door built-in wardrobes. There is an en-suite bathroom, which is fully tiled and has a bath tub and shower enclosure, a toilet, vanity basin, and heated towel rail. The other two bedrooms offer superb views from the same veranda. Both have en-suites, one with a bath tub as well as a shower enclosure the other with shower only, both bedrooms have fitted wardrobes and large veranda glass doors. The villa is set on a plot measuring 5400 square metres, mostly fenced but walled at the entrance side of the property. Behind the villa there’s another 5121 square metre land plot nicely kept which was bought by the owners so no one builds overlooking their property. The south facing roman shaped swimming pool is 8 metres by 4 metres and is situated to the side of the villa well protected from the wind. There’s a spacious patio area surrounding the pool with beautiful fruit trees and flowers. There is a well constructed paved area in front of the house and all the way to the entrance which can be used for parking a number of cars if required. There’s a vegetable garden beyond the swimming pool area with raised vegetable beds. The land continues north with all type of fruit trees planted, including orange, lemon, apple, pear, plum, peach, apricot, almonds, nespera, cherry, olive trees, almond, quinces and more. The property is situated near the village of Cabacos, which has several cafes and a mini-market, health centre, banks, post office, butcher, petrol station, pet/agricultural supplies and builders’ yard. Each Monday, there is a small market in the village selling bread, fruit and vegetables, plants, shoes and clothing. The house is approximately 10minutes by car from the town of Alvaiazere which offer a range of services and amenities such as, restaurants, cafés, market, banks, medical centre, post office, pharmacy, Police station, Registry office, Tax office, Court room, Indoor and Outdoor swimming pools, full size football pitch, athletics running track and more. 3 x 3.4m wide patio doors facing south with Electrically operated sun shutters.